Why You Should Implement Social Media Feeds On Your WordPress Website? Social media feeds can be a great contributor to the success of a WordPress website. There are several advantages of implementing social media feeds that a website owner can use for his business growth. The growth of social media is widespread and no business is left unaffected from the impact of social media these days. People have started using it for introducing their start-ups to their target audience and thus, it is clearly visible that these platforms have a remarkable potential to bring success to a business. These days, it is seen that a number of WordPress website owners are showing interest to implement social media feeds for their business. So, what social media feeds are and how the implementation of them can benefit a WordPress website? It is certainly a considerable subject for businesses and here, we are going to unwrap few reasons and other aspects of social media feeds to let our WordPress website owners know why they should implement it for their businesses. To grow connectivity with the customers or target audience, companies often make their social profiles on different social media networks. To keep visitors updated about what’s going on around various social media pages of that company and to show their popularity on social media networks, these companies use social media feeds on their sites. This is a great way to show the latest post or update about your company that has been published to any network on your site. Thus, the users of your website remain updated about all the latest happenings in and around your company. If you are quite active on your social media accounts on different networks and you make several social interactions a day, then you should certainly display your engagement and popularity on social media networks on your website. It puts a positive impression on the visitors as it is a way to get authoritative position among web users. When visitors find that you have a good fan following or you are good at social networking, they love to listen to you and follow you. So, by showing your social media feeds on your WordPress site, you grow your engagement with your audience and you also get support whenever it is needed. When an online audience gets a sense of something that is going on your social media network, they easily decide if they should participate or not. Thus, you get required favors and support from the ones who are following your social media feeds. The main purpose of every WordPress website owner is to get some business from their website. This is a reason, every business wants to drive visitors back to a site to promote their company services, products, and other causes. So, retweets are great; however, they cannot be greatest until they turn your followers into your customers. Here comes the role of social media feeds on your site. When, you have attractively treated these feeds on your site like a CTA – Call to action, it actually encourages better conversion and thus, helps in growing your revenue as well. If your company has launched any event or campaign for promoting products or services, social media feeds can allow them to easily aggregate conversations made on social media networks. In social conversations, users often use hashtags during their posts related to a company and hence, by gathering all such posts based on the hashtags, you can save buzz about the event. This is a great way to make the community of the loyal online audience for your brand. You may feel that content marketing is no more attractive; however, it still works. Another big reason of implementing social media feeds on your site is – it repurposes the social content that you have created on your social media networks by adding it on your WordPress site. A social media feed plugin like Social Streams enables one to enjoy two benefits with single treatment as it automatically includes social posts in a website feed without any extra effort from your side. Thus, it helps saving time as well as the effort to post similar information again and again. Social media platform like Twitter mainly encourages textual content; however, Instagram promotes visual content. Thus, giving a complete message along with pictures and text together can sometimes be a problem as followers get fragments of your story through varied social media networks. So, using social media feeds in an attractive manner, you can display the entire story of your company on your WordPress website that will surely clarify the viewers what the exact message you want to convey to them. 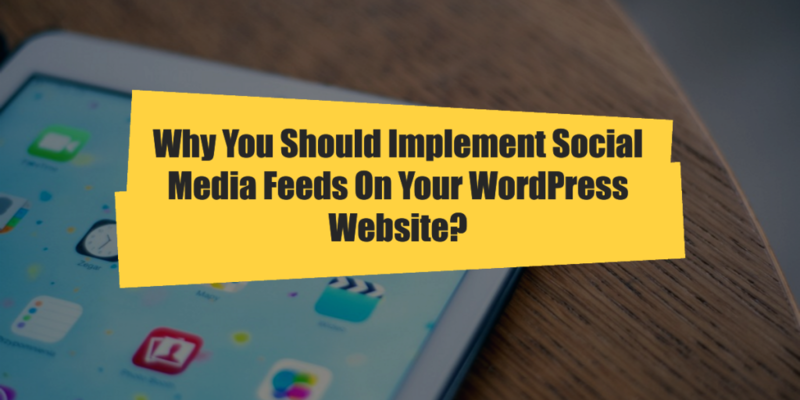 The reasons we have mentioned above are merely a few out of many other reasons that encourage you to implement social media feeds on your WordPress site. The effective use of these feeds is a sure way to grow your sales and generate good ROI. Jason is a dedicated wordpress programmer who works with WordSuccor Ltd., a leading WordPress Theme Development Company with a global reach. He is a passionate blogger who loves to write and share everything about WordPress and new web design technologies.